It's National Bed Month! 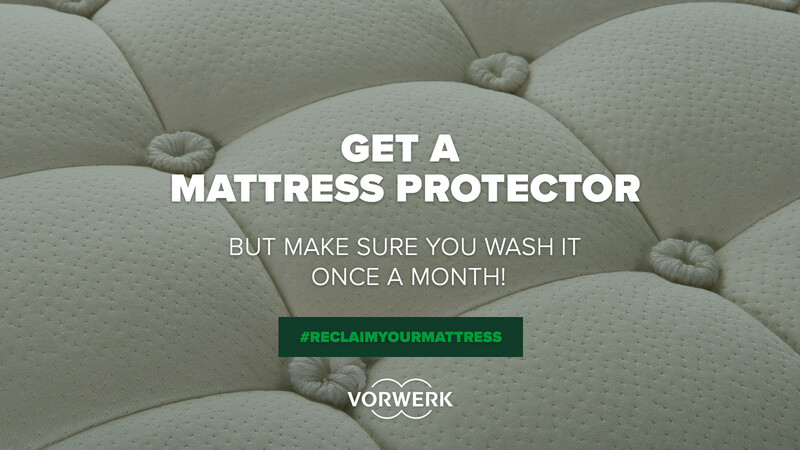 #ReclaimYourMattress and Your Health! We are a family of allergy sufferers. We snuffle our way through summer, and then, when the heating comes on, some of us even sneeze our way through winter! This winter has been particularly snuffly, and we have suspected many different culprits for the itchy eyes and endless sneezing. Dust, heating, winter bugs, but it was only recently I turned my attention to the beds. I invested in anti-allergy pillows, but they didn't seem to make much difference. I have, however, just found out a wealth of facinating, and, in some cases, a little bit gross, facts about mattresses. In case you were also unaware, your mattress is not the innocent bed-bystander that it would seem. Without a little attention now and again, there is a lot more going on in your mattress than you would probably care to think about. 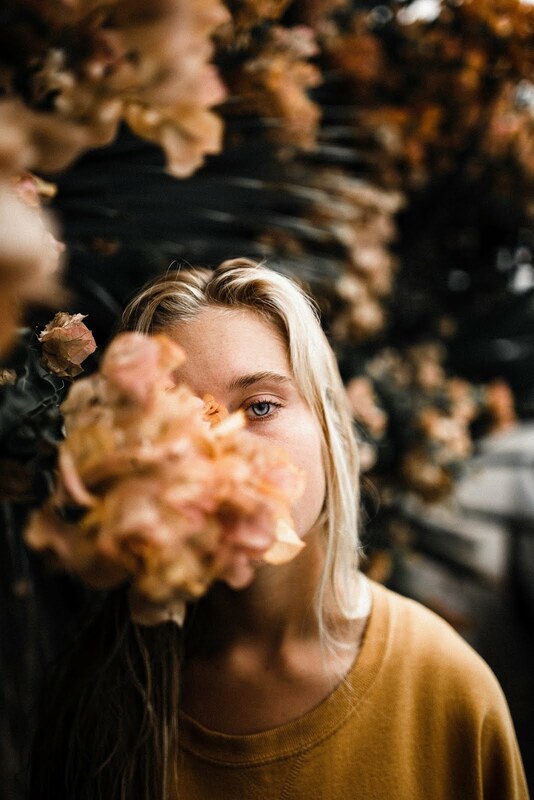 So, even if you don't currently suffer from sneeze-inducing allergies, it would definitely be worth finding out more about caring for your mattresses, so that you can be secure in the knowledge that you know what is going on in there! The team at Vorwerk asked me to take part in their #ReclaimYourMattress campaign for National Bed Month, designed to help the nation reclaim its mattresses for a happy, healthy night’s sleep. They have provided some brilliant tips for keeping your mattress in the best and most hygenic condition. But first, some less-than-savoury facts about the average mattress. Please proceed with caution if you are currently eating! 1) We lose half a pint of fluid (sometimes more!) every night – most of which ends up in our mattresses. 2) We lose a pound of skin (sometimes more!) when asleep every year – making our beds a favourite breeding ground for the common dust mite. 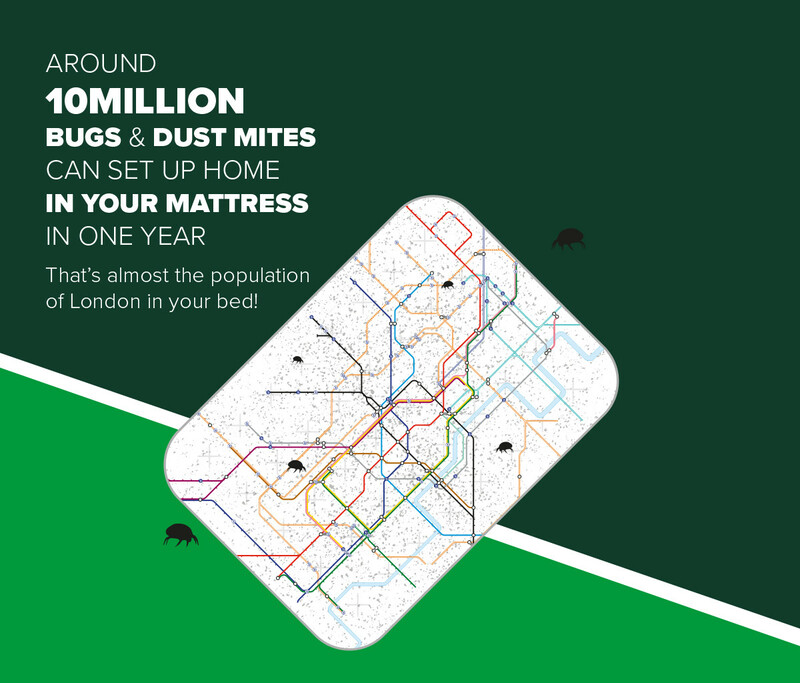 3) It’s rumoured that the average mattress can double in weight every 8 years thanks to a combination of human debris and dust mites. 4) A poll* suggests that more than half a million brits only wash their sheets three times a year (*Sheila’ Wheels, Feb 2010). 5) Around 10million bugs and dust mites can set up home in your mattress in one year. 6) More than a quarter of us would be embarrassed for other people to see the state of our mattress* (Sleep Council ‘Toxic Sleep’ survey 2011). 7) Beds as little as six years old could offer significantly less support and comfort due to factors including a build-up of debris such as skin and hair* (*Research by the Furniture Industry Association 2011). So that's the yucky bit out of the way, but what can we do about it? 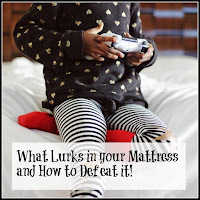 The answer is to treat your mattress like part of the furniture. It's very easy to forget it's there, but it really does benefit from a bit of TLC now and again. Firstly, vacuum your matress regularly. This doesn't have to be a huge job, when you change the bedding, and the mattress is bare, whizz over it with your normal vacuum cleaner for around a minute each time. This is a great habit to get into, to keep nasty dustmites under control. For extra reassurance against unpleasant mattress-dwellers, you can actually dry clean your mattress. This gives a much deeper clean, removing a lot more than just the surface dirt of the vacuum cleaner. Whilst vacuuming your mattress will remove surface dirt effectively, dry cleaning it will ensure that you achieve a thorough, deep clean and leave each one sanitised and hygienic. 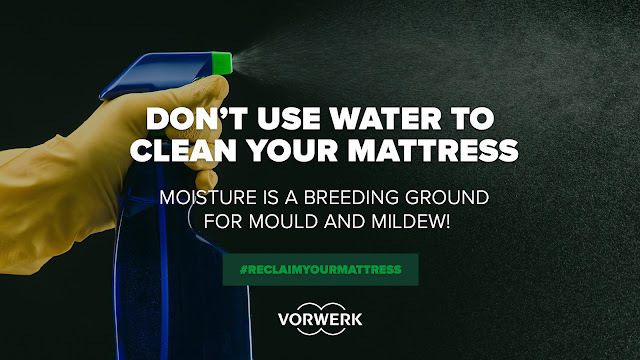 Research shows that the average household mattress contains large amounts of dead skin cells, mould spores, sweat and droppings from millions of dust mites; all of which build up over the years! Which is really yuck, and not something that you want to be thinking about to much, so an occasional dry clean can work wonders for your peace of mind. Next, don't forget to turn your mattress. I used to think this was an old fashioned thing, but there are a world of reasons why it's important to rotate and flip your matress regularly. As well as ensuring the mattress wears out evenly, decreasing the chances of uncomfortable bumps and dips over time and increasing the life of the mattress, I hadn't realised it actually helps to keep it cleaner too. Rotate or flip every few months, to give your mattress the best chance of lasting longer and staying cleaner too. Now this one may seem obvious, but water is a bad idea for mattresses. They take an age to dry and it encourages mould to grow, so it's completely impractical. A warm, moist environment is not healthy, unless you are a mould spore. If you need to spot-clean a stain, use as little water as you can and make sure it is totally dry before recovering. When children are little and accidents are possible at night, investing in a good quality matress protector early on, can save a lot of time and effort, as well as avoiding unhealthy mould growth where you can't see it. Also, and this isn't something anyone really wants to dwell on, unless they are especially strange, but people are generally sweaty. On average, an individual will sweat out around half a pint of perspiration each night. To avoid musky, blokey (sorry guys!) smells building up in your boudoir, treat your mattress to a dusting of baking soda and leave for thirty minutes, before vacuuming off. Mattress protectors are not just for children's rooms. As they can be removed and washed, they do a great job of absorbing sweat, oils and dead cells from skin, as well as protecting against accidental spillages. 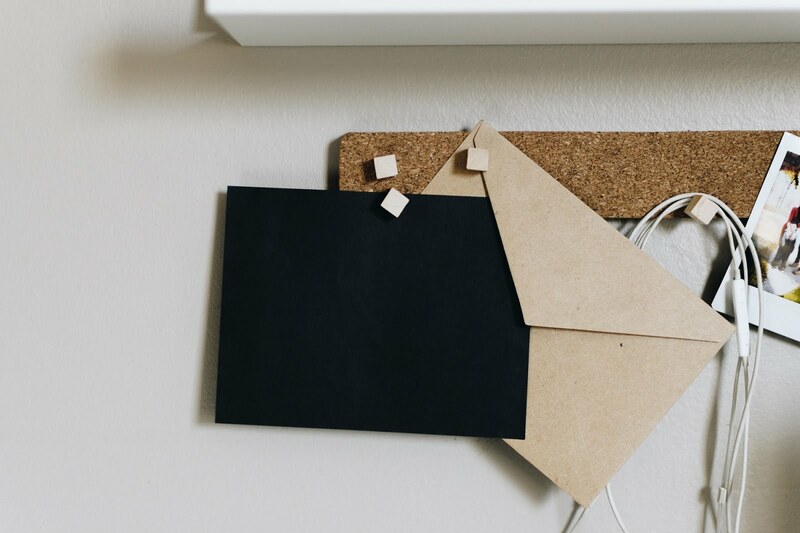 Particularly handy id you get a lot of overnight guests. I hope you found all this information as enlightening as I did and it didn't put you off your breakfast too much. 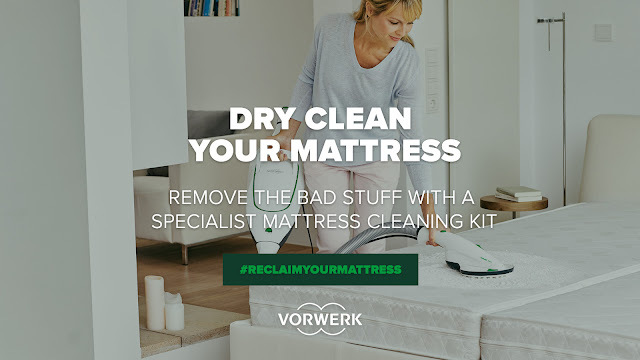 To end on a happy note, Vorwerk is giving you the chance to win a Kobold VK200 with mattress cleaning set to help you #ReclaimYourMattress. To enter and be in with a chance, visit the site between 13th – 18th March, your mattress will thank you!